Here's something for you! 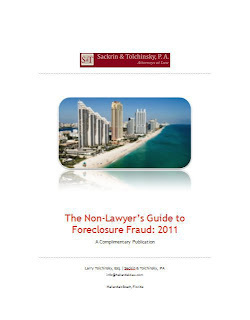 A free, complimentary publication that goes into aspects of clearing title or quieting title in the State of Florida -- something very important to know in today's Wild Wild West days of Foreclosure Fraud in Florida real estate matters. Here's something for you! Our free complimentary publication providing background on the Foreclosure Fraud Housing Crisis that has hurt so many Floridians in the past several years.